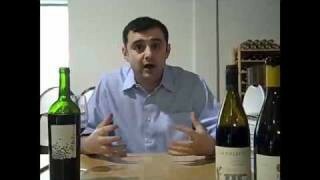 Gary Vaynerchuk today looks at $12 wines and sees how much of a value these wines are. Is 12 the new 10? Watch and find out. Wil, thanks for the good words and for the heads up on the vintage (I saw the 2004 on the close-up as well). The WL code is the first item to be entered (actually by WL’s Chris Mott, aka Anti-Chris). At that point the other info (Vintage, Wine Name, Wine Price) auto-populates per the data in Wine Library’s database. Hence, the WL info in the WL database needs to be changed….I will let Chris Mott know so he can fix it. Dr. Loosen from 1982 that was originally purchased for $8.99, second the Gruet Blanc de blancs and the Blanc de Noir both under $12. Have not found the Garnacha here in VA but did find it in Houston at Central Market and it was a good buy. Isn’t Sterling ownde by Coca Cola. The only thing I’ve ever found impressive about the place is the tram ride. 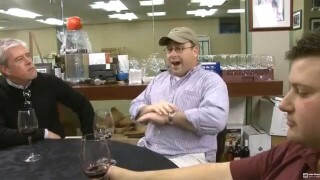 I was recently corrected on Meritage pronunciation in Paso Robles by several of the wine pourers. 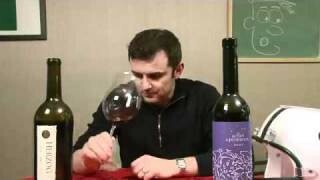 I tasted the Aglianico over two evenings last weekend. I was really looking forward to it. However,I couldn’t get any smell or taste other than dirt, try as I might. There was no cherry, chocolate covered or otherwise. I generally like dry wines with earthy, tobacco like characteristics but this was over the top. How Gary can say this would keep a New World drinker interested is beyond me. I was very disappointed. Gary Kiiiiiiiiiiiidd!! I like it! I guess its a case of po-tay-toe/po-tat-oh. However, “Carmenair-uh” sounds more Spanish to me. Being a Canuck: I’m more familiar with French pronunciations than Spanish. It was from the Vay-ner-chuk himself, that I learned how to pronounce [b]Rioja (Reo-ha)[/b] and Tempranillo (Tempra-neo). 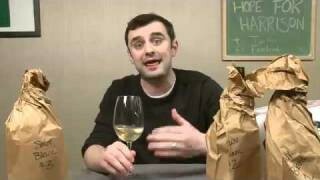 In the multinational world of wine, we all need help with our pronunciations from time to time. Certainly nothing to get offend over, right TommyBoBo? Offended rather. I wish this comment section allowed editing of ones posts. Nice ep. 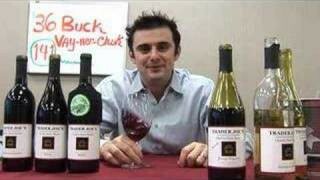 Good to taste everyday wines some time. QOTD: mmm, so that’s 8-9 EUR for me. Maybe the Deetlef’s Pinotage then. 8,99, so, nice QPR. Not overwhelming, but ok. I would have bought some extrra case when I’d had the opp. still. 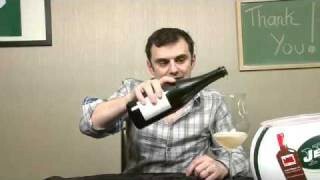 The Bourgeui I’m sipping a know is a zilch in the glass though … pity. QOTD: Quattro Mani Montepulciano d’Abruzzo. A beauty for $8! It really did evolve in the glass, unlike some of the extraction bombs in this price range I’ve had recently. No line in the sand for me. 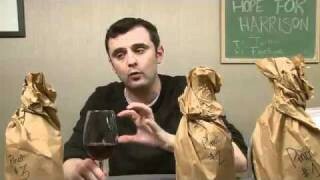 QOTD – Two Up Shiraz, thanks to Gary’s WLTV tip!! White (and overall) is a 100% home-run for 2004 Brancott Sauvignon Blanc. Wonderful $12 wine. 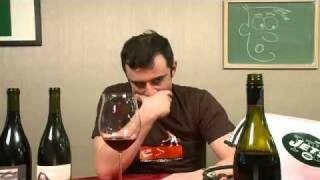 Red: 2004 Concannon Petit Sirah, tasted (and over-rated by a point 😛 ) by Gary a bunch of episodes ago. Still an awesome $12 wine. You could DEFINITELY kill someone with the bottle. VERY thick glass. QOTD – 2005 Lindemans Bin 50 Cab – $5.99 on the rack, with a $2 rebate down to $3.99 – this may be the best wine value I have ever had. 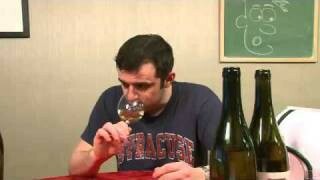 Just had a glass of Katharine Kennedy for $12……. Once again, enjoyed the show. Nice wines that were enjoyed in last month or so. Palo Alto Reserve from Chile is the best $12 wine I’ve ever had in my life. I give 93+ and I think that’s being conservative. This is an undiscovered masterpiece. i’m a newbie (lurker, i guess?) best $12 bottle…2001 Kunde Estate Zinfandel. Another month+ lurker has jumped in. QOTD: I found the Rodney Strong 2003 Sonoma Cabernet Sauvignon on sale for $11.99 and have went back for more. 90 WE and It’s an absolute steal at this price. I recently bought the Winner’s Tank Shiraz and was very pleased with it, I didn’t find it to be as over-the-top as you did but it still had very strong characteristics. 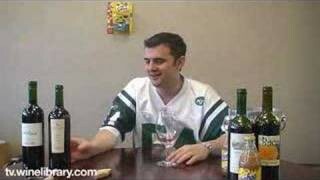 The best under 12 dollar wine I had recently was the 2006 Oyster Bay Sauvingnon Blanc which rocked my world. I tasted a sip of my roommate’s glass of the Sterling and liked it a lot. The experience was probably very different than Gary’s because my roommate does not decant or let the wine sit after opening it. We both really like wines with chocolate flavors, and this one tasted like that to me. This is kind of an amusing thread about how to pronounce “carmenere.” I suppose it depends on whether you want to pronounce it like the French do, or like the Chileans do. But since it originally was a French grape, and it’s a French word, I’d be inclined to pronounce it the French way. And the French would pronounce it “carm-en-aire”. 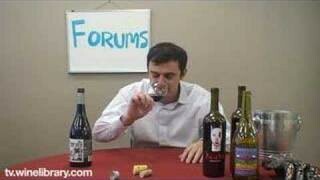 newbie here…has there been a show solely on organic wines yet?